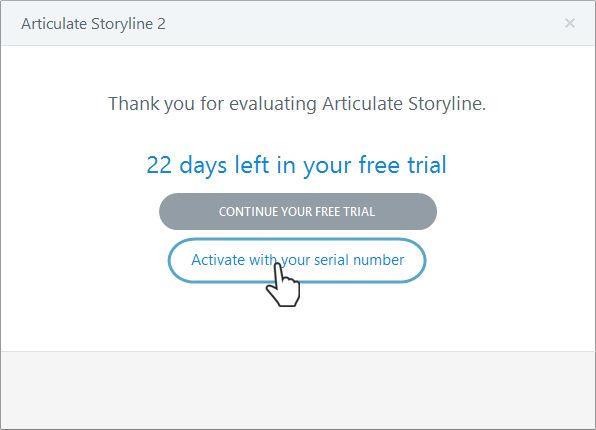 After installing Articulate Storyline, you'll have a 30-day free trial period. Storyline is fully functional during the trial period. When the trial period expires, you'll need to activate your software with a serial number to continue using it. You can also activate at any time during your trial period. 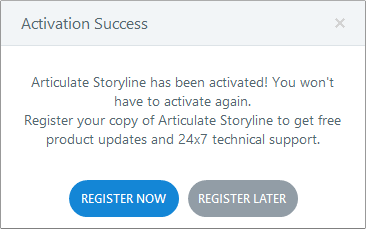 If you don't already have a serial number for Storyline and you'd like to purchase one, click here. 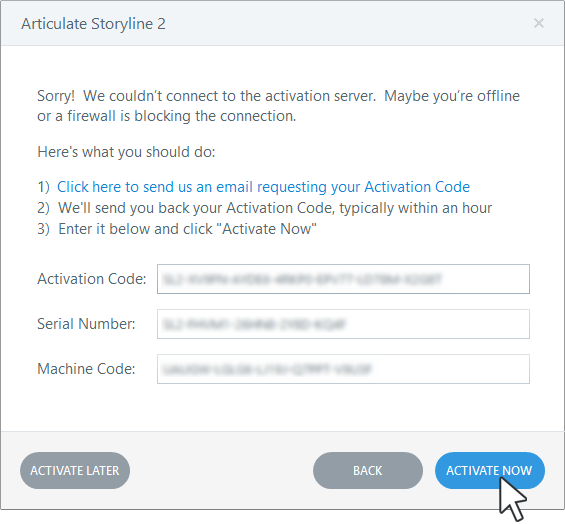 Tip: Automatic activation will fail if you don't have an Internet connection or your firewall is blocking communication with the Articulate servers. If automatic activation fails, you'll be prompted to proceed with manual activation. See the next section for manual activation instructions. 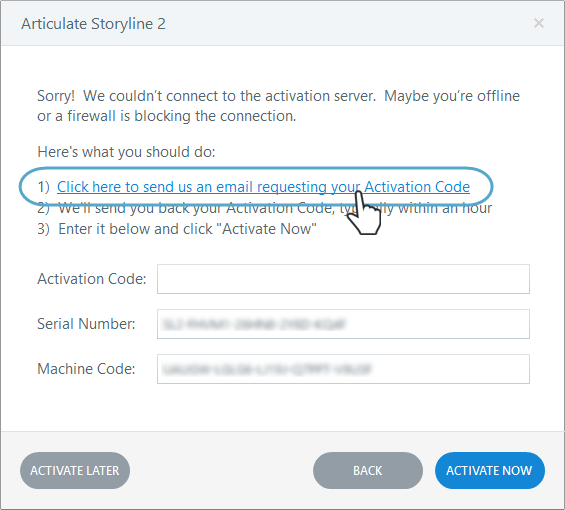 Copy the serial number from your product confirmation email, paste it into the Serial Number field on the activation form, and click the Activate button. If you're prompted to proceed with manual activation, skip to the next section. Otherwise, when you see the Activation Success dialog, click Register Now to register your software. Registering makes it easier for us to assist you when you need support. If you've already registered, click Register Later instead. That's it! 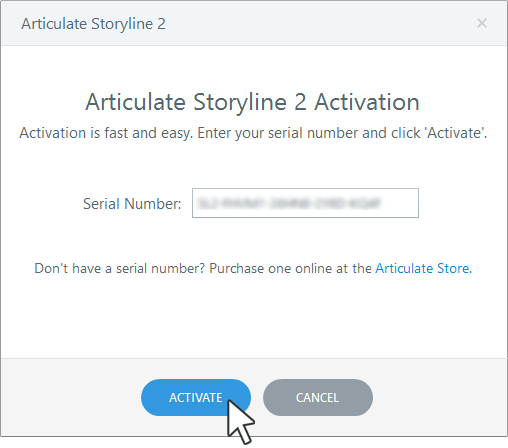 To manually activate your Storyline software, perform the four steps listed above for the automatic activation method. When the automatic method fails and you're prompted to proceed with manual activation, click OK. 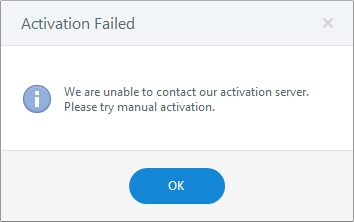 When the manual activation form appears, click the link that says: "Click here to send us an email requesting your Activation Code." 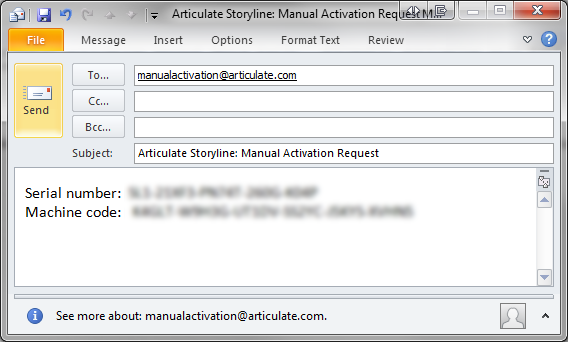 Create a new email message in your email program and address it to manualactivation@articulate.com. Copy the serial number and machine code from the activation form, and paste them into the body of your email. IMPORTANT: The text "Serial Number:" and "Machine Code:", including the colons, must be included in your email as shown below. You can only submit one serial number/machine code per email. Check your junk mail folder or your spam folder, and ensure that you can receive emails from support@articulate.com. If you still can't locate the automated response, submit your request with the serial number and machine code to support@articulate.com. When you receive the email with your 33-digit Activation Code, copy and paste it into the manual activation form where indicated, then click Activate Now. When you see the Activation Success dialog, click Register Now to register your software. Registering makes it easier for us to assist you when you need support. If you've already registered, click Register Later instead. If you're unable to activate your software, please contact the Support Team.